Renting vs owning…..there are so many positive reasons to make the move! The first one that comes to my mind is, Why pay someone else’s mortgage when I can be paying my own!” From tax breaks to a sense of security, there are many. 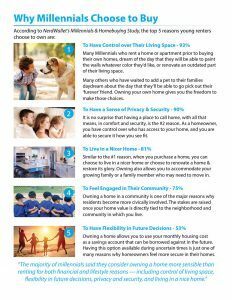 Click on the link to see what millenials say are their top five reasons to own a home!